Asus doesn't half like to stick it to Apple when it can. First the ZenBook UX305 from last year showed Apple up by being what the rapidly-ageing MacBook Airs should be. Now the Asus Transformer Book Flip TP200SA laughs right in the face of the 12-inch MacBook by doing much the same thing but costing just £249. Oh and it has 360-degree rotating display and a touchscreen just to make the cut even deeper. If you want an ultra-portable laptop for typing in cafes or watching Netflix in hotels your £249 can't really be better spent. Just don't expect any performance miracles. Ask too much and things get sloooow. So is it worth it? The Asus Transformer Book Flip TP200SA is a laptop of real highs and significant lows. We're going to tackle the lot but let's start with the good stuff. This is a laptop you could easily mistake for one costing twice the price. You might not think of Asus as a style guru but it has hit the bullseye here. It's sensible-looking but has little flashes of, well, flashiness that tell you it isn't designed for a life cooped up indoors. First there's the lid, which is capped with real brushed aluminium, not the fake plastic stuff you might expect at this price point. In many ways this laptop looks like the nephew of the Ultrabook-style UX305. On the inside you don't get any of the expensive materials but the look is maintained. The keyboard surround is plastic and has a very light brushed metal effect that both catches the light and takes away any of the tacky feel of plain plastic. Our favourite little aesthetic tweak, though, is around the TP200SA's screen. Where most budget laptop screens are plonked in front of you like the unbuttered white toast of a motorway services breakfast, this one is curved around at the sides. That curve is plastic — nothing too fancy — but just like the metal lid it adds a touch of sleekness we just wouldn't expect at £250. The Asus Transformer Book Flip TP200SA has the look. But it has the practical side down too. While no 12-inch MacBook-botherer if you look at all the numbers it still weighs just 1.2kg and is 18mm thick. At this price it doesn't need superlatives to make its point. 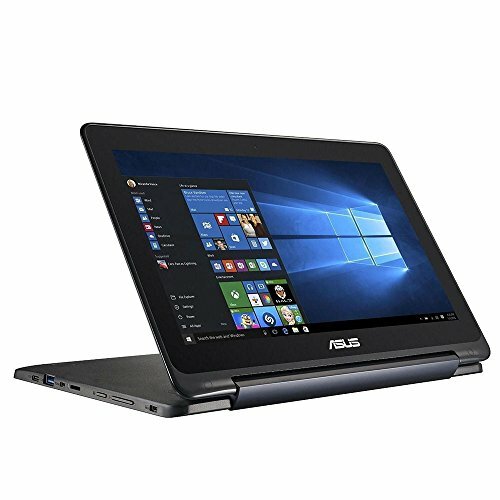 If you're on a very, very tight budget then this Asus is almost certainly one of the best ultraportable options around. We've been using it as a road warrior workstation for trips out of the office for the past couple of weeks and it's perfectly suited to that role. It's far better than a 10-inch hybrid tablet because it has none of the weight-balancing issues and uses a full-size keyboard. This last point is the real zinger: you can type thousands of words on the Flip TP200SA at a time and it doesn't feel as though you're welcoming carpal tunnel syndrome into your future. Switching from a MacBook Pro to the Asus Transformer Book Flip TP200SA and the key response is a bit softer. But it doesn't immediately feel like downgrading from a Mercedes to a 20-year-old Fiesta. This laptop isn't good at everything but it does make a pretty fantastic out-and-about light duties machine. The battery life supports this too. Out in a well-lit cafe you'll probably want to use the Transformer Book Flip at around 50 per cent screen brightness. At that setting it lasts, in our experience, about seven and a half hours off a charge. Sure, some Android hybrids last 10-plus hours but the key thing is the Flip feels like a proper laptop. It runs Windows 10, and has a decent-size 11.6-inch screen. Hybrid skills are strictly side appeals in our view, but they are here in the Transformer Book Flip TP200SA. A free hinge that lets the display flip all the way back onto the keyboard's back means you can prop it up in a "tent" position — just the ticket for watching films on ultra-cramped train tables or to prop it up in bed. The display auto-rotates as you flip it around and switches the keyboard off automatically when the screen is flipped all the way, prompting you to switch to Windows 10's touch-friendly mode too. Is the Asus Transformer Book Flip TP200SA a great tablet? Of course not. If all you want is a tablet, buy one. But having this flexibility when it hasn't bumped-up the price is welcome. The touchscreen is handy too, if only to make up for one of the laptop's weaker points: the trackpad. Parts of it are great; the size, the position and the button arrangement are all fine. However, as with a lot of cheaper trackpads, it's just not all that responsive. When browsing simply using the touchscreen works better a lot of the time. It's also, of course, a basic plastic pad. High-end laptops use textured glass to get the right friction-y feel. And while Asus has had a good stab here it obviously just doesn't feel as good as a luxe one. What do you expect for £250? The laptop hinge isn't perfect either. While strong enough to hold up the screen at just about any angle it will cause the display to wobble if you're a heavier typer. Now we've started to deal with some of the Asus Transformer Book Flip TP200SA's bad points let's open the negative flood gates. The biggest issue is performance. The Intel NB1050 CPU used inside is basic. It's an entry-level processor and when matched with 2GB RAM the performance compromise is very often obvious. Try to do a few things at once and rudimentary problems like web page scroll jagginess, keyboard input lag, and non-smooth cursor movement rear their heads. If you want to install something on the NB1050 it's best to head out and make a cup of tea while the Flip TP200SA is doing the work. It's no multi-tasking demon, so loading apps takes longer than a properly-specced laptop too. Keep your expectations realistic. After getting all the updating-installing setup work out of the way we found the Transformer Book Flip perfectly up to its remit as a little light-use laptop, though. There's the occasional hiccup but for the sort of work we need to do when out and about – writing checking emails browsing – it's great. If you've been spoiled by super-powered laptops until now you might want to check out an Intel Core M laptop instead. You won't find one anywhere near this price but it offers similar efficiency and much smoother performance. As much as we like the Transformer Book Flip it does require patience at times. This isn't just a low-power CPU though. It's also a tremendously efficient one. Its transistors measure 14 nanometers across, the same scale architecture as you find in a phone like the Samsung Galaxy S6. Such an efficient processor means the Flip doesn't even need a fan. It's totally silent, all the time. Given how limited the Asus Transformer Book Flip TP200SA power is, its gaming performance is surprisingly not utterly terrible. It doesn't have a hope of playing many recent games of course but it can handle older games like Stalker: Clear Sky if you pare back all the fancy lighting effects. This is because of the massive improvements made to the latest generation of Intel integrated GPUs. Would we trade that away for smoother day-to-day performance? Absolutely. But that's just how it is. The bit that really hits home how little the Asus Transformer Book Flip TP200SA is designed to handle is the storage. There's just 32GB solid state memory (SSD), just under 20GB of which you have access to due to installs and the like. It's also nowhere near as fast as proper SSD storage. It's more as though the Flip is running off a 32GB memory card. Thankfully, there's a memory card slot on the side for expansion. The last big question mark is screen quality. This Asus is nowhere near something like the Surface Pro 4 or MacBook 12-inch, but it's far better than we feared. The issue with a few ultra-budget 360-degree hybrids we've seen is that they use TN panel screens, the kind found in much older laptops. These screens look horrible from some angles and not all that hot from anything but dead-on. The Transformer Book Flip TP200SA has a much more tablet-like IPS LCD screen that looks just fine from any angle though. There's some loss of brightness, but that's about it. Colour saturation is also much better than some earlier Asus hybrids, most of which are quite undersaturated. This one is no Technicolor superstar but colours look "about right" to the naked eye. You won't get super-deep, rich shades - but what it can render is fairly well calibrated. Get this: in using an IPS screen the Asus Transformer Book Flip TP200SA display is actually a lot better than that of the MacBook Air 11-inch in several respects. It's far from perfect though. First resolution is fine and nothing more. At 1366 x 768 pixels spread across 11.6-inches this Asus looks more like a laptop screen than a tablet one, even though its tech comes from tablet town. It's clearly pixellated but even now expecting a 1080p display from Asus at this price feels like asking a lot. There are some durability and quality control concerns too. In our review model there's pretty serious backlight bleed in the bottom-right corner, which is where parts of the screen appear a bit brighter. It's only really visible when looking at a very dark screen with fairly high screen brightness, but is one of the few obvious signs this is a cheap device. The Flip TP200SA display's top layer is also not very tough compared with a good tablet. It's very easy to cause ripples in the display with finger pressure. Our advice is to get a neoprene sleeve or something similar to avoid damage. There are issues here, sure, but our reaction on getting going with the Asus Transformer Book Flip TP200SA was one of relief. Phew… Asus really hasn't messed this one up. It really seems to have made a lot of the right choices given the available budget. But the one part that continues to grate is the wobble-happy screen. This can become pretty distracting as the display surround (and actual display) has a glossy finish reflecting your face back at you complete with emphasised micro-wobbles. It gets annoying, but it doesn't eclipse the Asus Transformer Book Flip TP200SA's appeal. It feels a lot less gimmicky than some budget hybrids and comes across as a complete laptop. It even gives you a year of Microsoft Office 365 which is pretty mad given the price (that kind of sub currently costs £50 alone). There's plenty of scope for hooking up other gadgets too. The Flip TP200SA has one USB 2.0 port, a USB 3.0 port, microHDMI, microSD and a USB-C connector (the small one). That's the loadout of a laptop, not a tablet wannabe. While the limited performance means we wouldn't suggest making the Flip a main "home PC", those connections make it possible. The Asus Transformer Book Flip TP200SA even has remarkably good speakers for a bottom-rung device. They sit at each end of device's underside, don't sound harsh, have a little bulk to them, but a neutral tone. Do you want a basic laptop to take out and about with you for a bit of work or play? If you have a little patience then the Flip really is a winning combo. For less than a third of the price of the latest MacBook you get something not a million miles away from it. Well, sort of — it'll come across like a poor copy of it in every single respect. But then we'll just refer you back to the price. With a respectable screen for the price (that's the hot word here) and decent enough keyboard the only question is whether you can cope with its very limited performance. This Asus is not fast. It's not made to juggle a load of different apps at once. Just as a Core M CPU isn't a Core i7 a Celeron N3050, this setup with 2GB RAM really isn't a match for a Core M system either. However, when all's said and done the Asus Transformer Book Flip TP200SA is as good as it gets for £250 right now. Not a miracle maker, but it's still flippin' good value.